Welcome to the our column The New Royals, in which we introduce you to the noteworthy youngsters we know are destined for fame. Some will actually be from royal or princely families, others will be the brethren of showbiz's kings and queens. Whatever the case, they'll be fabulous. James Duke Mason is a third generation show biz man. Son of singer Belinda Carlisle and political activist Morgan Mason, he's also the grandson of acting legend James Mason. 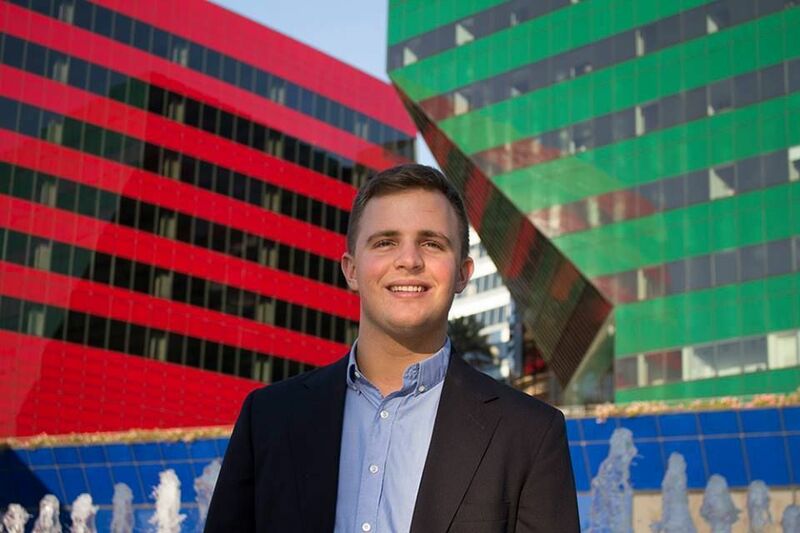 At the ripe old age of 22, he ran for West Hollywood city council and even though he lost, he's still got a zeal for political activism. We caught up with the now-23-year-old to talk about politics, the entertainment industry and Hollywood clichÃ©s. How did you end up becoming a full-time political activist? Public service and advocacy have always been passions of mine. I think it was a mix of my Dad's work in the Reagan White House with my Mom's progressive political views; in other words, I was into politics, like my Dad, but on the other side of the political spectrum! Then, when I came out as gay at age 14, that also informed my political identity as well. How did you end up living in Hollywood? I was born in Los Angeles, and even though I spent a lot of my childhood living in Europe, I always felt like L.A. was home and wanted to move back here. As soon as I graduated high school I got on a plane and came home, and immediately got involved in the gay community. Your family has a long history in the entertainment business. Did you ever consider going into that line of work? I'm actually producing a film project right now, in addition to all my political activities, called Jack & Lem, an incredible true story about the late President John F. Kennedy and his lifelong best friend Lem Billings, who was openly gay at a time when homosexuality was way more taboo than it is today. Who knows if it'll get made, as the movie business is pretty fickle, regardless of what connections you may have, but I think it's an amazing story that needs to be told. You volunteered for Hillary in 2008. Will you work for Hillary during this primary season? Absolutely. I was proud to work for her in 2007/2008 and have already been in touch with several contacts of mine who are working on her campaign about getting involved on a substantive level! You lost your first election in Hollywood. Do you have plans to run again? This is definitely just the beginning for me in terms of my public service. I didn't win in March, but I was very proud of my result. I intend to spend the next couple years involved in the nitty gritty issues that impact West Hollywood, and if it makes sense to run for City Council again or to run for some other office, then I'll take that step when the time comes. What's the one clichÃ© about Hollywood that you find is not true? That we're a town of vapid people who don't care about anything. That may be true with some of us, but I can promise you that there are just as many vapid people in New York, Miami, San Francisco, London, Paris, or any other major city around the world. People in Los Angeles, particularly in the West Hollywood area I live in, are by and large very kind and very authentic, and want to protect the history and urban village vibe that makes our city so special.